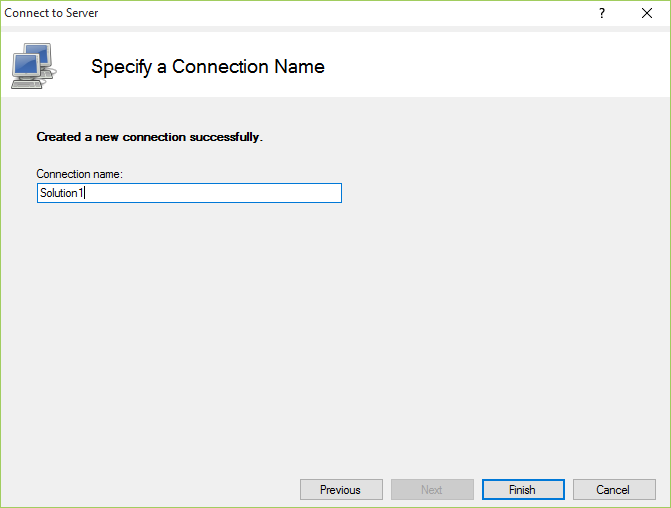 This page shows you how to add IIS Express servers in Jexus Manager. You need to add an IIS Express server in Jexus Manager before managing its configuration. In older Visual Studio releases (such as 2012/2013), a global IIS Express configuration file can be found at %userprofile%\documents\iisexpress\config\applicationhost.config or %userprofile%\my documents\iisexpress\config\applicationhost.config. If Jexus Manager detects this file, a default server called “IIS Express” is automatically created and showed. 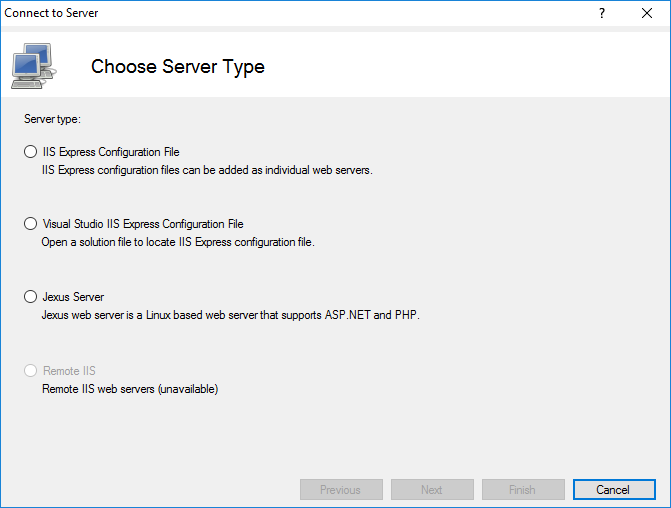 An IIS Express server can be easily created from a custom configuration file. Choose IIS Express Configuration File and click “Next” button. Give this connectioni a unique and meaningful name. When you create a new web project in Visual Studio 2015/2017, the IDE adds a custom IIS Express configuration file to the project folder at ($SolutionDir)\.vs\config\applicationHost.config. This file (and the .vs folder) is hidden by default in Windows Explorer. IIS Express custom configuration is documented in this blog post . JetBrains Rider uses a similar approach, and it puts the configuration file at ($SolutionDir)\.idea\config\applicationHost.config. This file (and the .idea folder) is hidden by default in Windows Explorer. 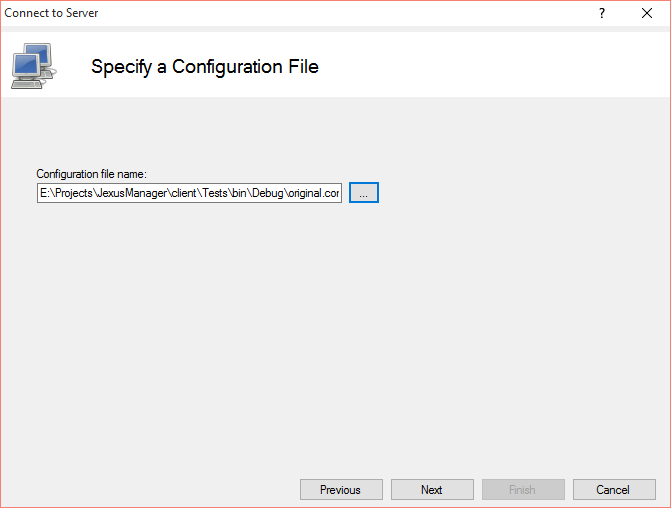 Jexus Manager allows you to add such a solution file as a new IIS Express server (so it automatically locates and reads the hidden configuration files). 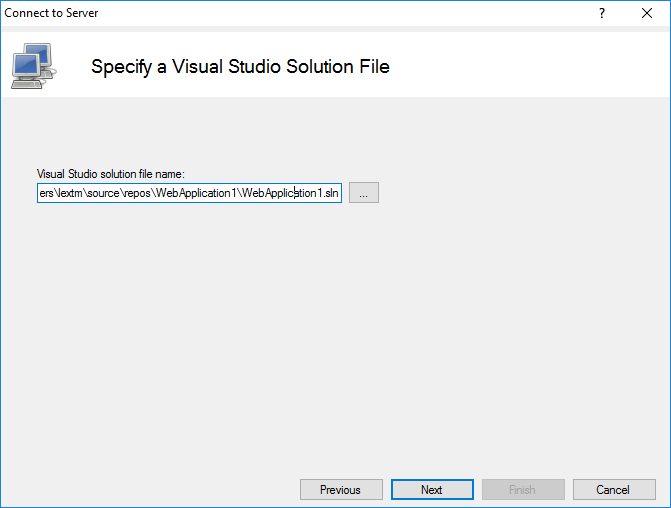 Choose Visual Studio IIS Express Configuration File and click “Next” button. 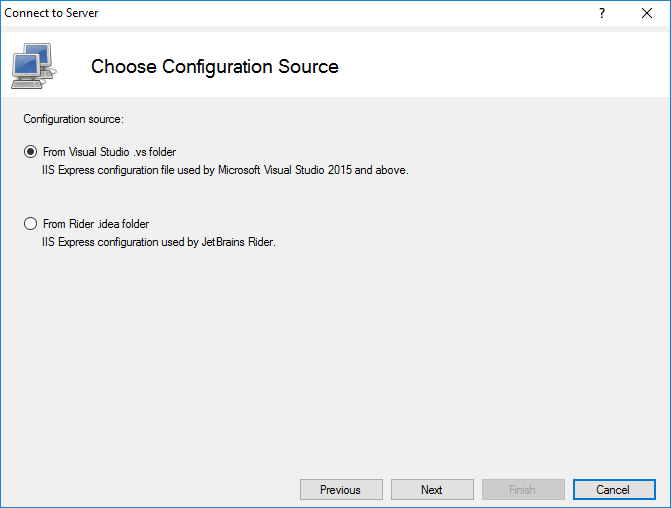 Specify which custom configuration file to use, from Visual Studio or Rider. Jexus Manager takes care of the rest to manage web sites and applications. For new projects/solutions, please debug/run them at least once in Visual Studio, so that IIS Express configuration file can be added. Give this connection a unique and meaningful name. 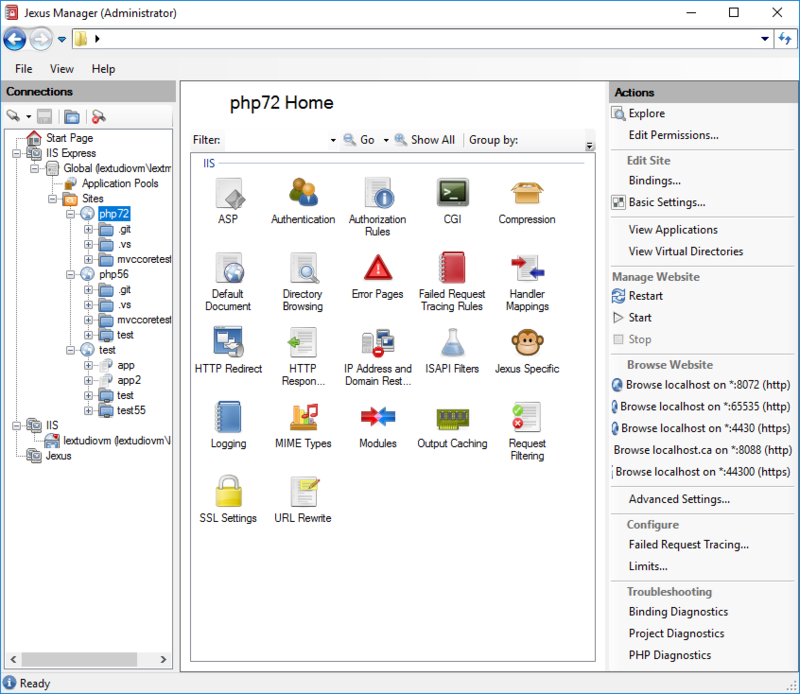 Once a server is added, sites and applications can be managed by choosing one of the categories in the middle panel.